A Segway is a two-wheeled machine that moves a person in a particular direction. An inner apparatus detects weight and changes in the positioning of the rider in order to propel the rider forward. Although they are fun for riders of all ages, Segways can cause serious injuries or death to a rider who gets into an accident. Sometimes they stop suddenly or travel backwards. The machine depends on balance, which means that you can get thrown off and hit the ground, another rider, or a hard object. 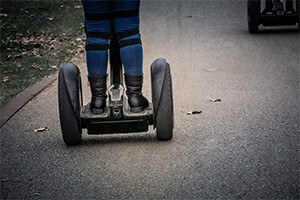 If you have been hurt while using one of these devices, the Chicago Segway injury lawyers at Moll Law Group can provide legal representation. We are familiar with the issues that may arise in these claims, having accumulated substantial experience as transportation accident attorneys. Most people think of Segways as entertaining toys, but they are also transportation devices. The rider must self-balance on them and is particularly vulnerable to debris on the road, uneven road surfaces, and other road abnormalities. If you are injured because of another rider or a driver's actions or omissions, you will most likely need to establish negligence by a preponderance of the evidence. This means you will need to prove the defendant's duty toward you, the defendant's breach of duty, causation linking the breach to your injuries, and actual damages. Your own negligence, if any, may affect the compensation that you receive. Under the doctrine of modified comparative negligence used in Illinois, an accident victim may recover damages if she is less than 50% at fault for the injuries. This means the jury will determine the total damages and assign a percentage of fault to both the plaintiff and the defendant. If the damages were $150,000, and you were found to be 30% at fault, while the driver was 70% at fault, you could potentially recover up to $105,000 from the driver. A Segway injury attorney can help Chicago victims seek to minimize the degree of fault attributed to them. In some cases, Segway accidents occur due to improperly maintained property. If you were invited onto the premises either for a pecuniary benefit to the property owner or for social purposes, you may be able to recover compensation in a premises liability lawsuit. In that situation, you will need to establish that the owner knew or should have known in the exercise of reasonable care about the dangerous condition that caused the accident. Sometimes a Segway accident is a result of a product defect. For example, some Segways have been known to apply reverse torque to the wheels, causing the rider to fall off. If this happens, you may be able to hold the manufacturer or retail supplier strictly liable for your injuries. Some people rent Segways. If you were injured while riding a Segway you rented, you may be able to hold both the commercial supplier and the rental company liable. If you have been hurt while using a Segway, you should not hesitate to consult the Chicago Segway injury attorneys at Moll Law Group. We can investigate your situation and determine which parties should be held responsible. We provide legal representation to injured people in Naperville, Schaumburg, Wheaton, and communities throughout Cook County. Billions of dollars have been recovered in cases in which we have been involved. Call us at 312-462-1700 or contact us online to set up a free appointment with a personal injury attorney.